At first glance, assortment optimization in retail seems to be a background task, though it often hides the significant possibilities for growth of profits. Please find hereby a case of an international production company that optimized the management of its product assortment based on the Theory of Constraints. Indian company Fleetguard Filters Pvt Ltd is engaged in production of air and oil filters and carries out the goods via retail and distribution chain. After analyzing the situation in the company, the root problem was defined. Having a wide assortment of goods, the company was focused on production of goods with the biggest margin. The logic is correct at first sight: to produce the products that generate more money. However, the actual demand was not taken into account while placing production orders. As a result, the high-margin products were non-demanded in market and therefore were only causing losses and blocking floating assets. These products were forcefully “unloaded” to distributors, while the latter demanded increasing the credit period reasoning that they have no money as the previous lot of goods was not sold. Relations with distributors were gradually becoming worse and they started refusing to place their orders at the plant and looking for alternative manufacturers. Everybody’s profits dropped. It became clear that the assortment and amount of goods that are produced by the plant did not always coincide with the actual demand. A task for optimization of company’s product assortment had occurred. In order to balance the release of goods with the clients’ demands, it was decided to implement one of the most important ТОC instruments – dynamic buffer management. The system of buffers enables to maintain inventory in each point of delivery chain at the optimum level without surplus or shortage. Buffer responds to the change in demand, compares it with the surplus level in a stocking location, estimates the necessary amount of inventory replenishment and indicates to the previous element in delivery chain about which product and in what number should be replenished. The buffer is conditionally divided into three similar (33 %) zones: risk zone, optimum zone, and safety zone. 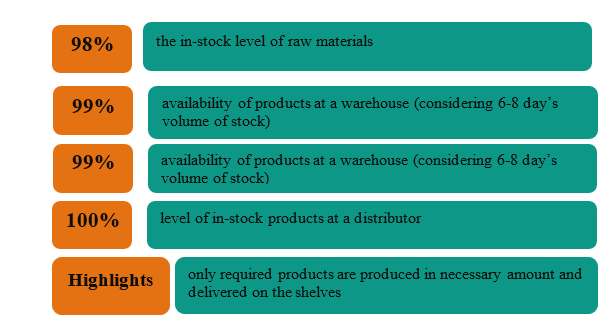 The inventory amount corresponding to one or another zone is estimated by volume on a case-by-case basis due to the demand for a specific commodity item in a specific stocking location, as well as due to other peculiarities. Thus, each element achieved its own buffer (see Fig. ), which reflects the level of existing stocks in each point of assortment in each element of delivery chain. So, that’s how it structured the work of the whole system. 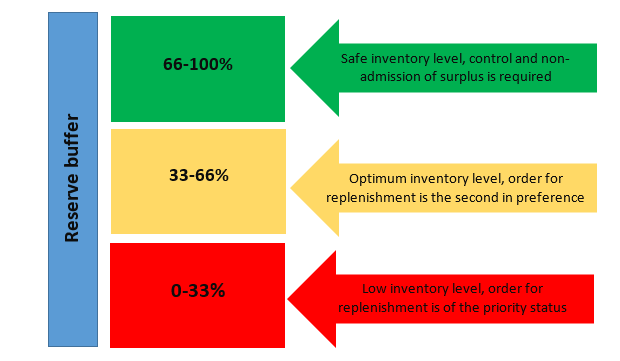 The distributors, based on everyday sales figures, placed an order for such a number of goods so the inventory level of each product on the shelf was in the yellow zone of the buffer. The plant warehouse processed these orders and transferred them to the plant indicating the sequence of production and number of goods. shipment of finished products to a distributor. The buffer of the plant warehouse indicated what products should be produced and in what sequence, as well as formed the schedule of shipment to the distributors: goods in the red zone were produced and delivered in the first place. Thanks to the constant availability of much-in-demand assortment, the all participants’ profit has grown – from the plant to the distributor. Turnover has increased, money was not blocked in the unneeded products, and production capacities are used in the most effective way.